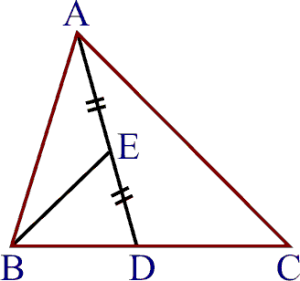 Q.1 In figure , E is any point on median AD of a ABC. Show that ar (ABE) = ar (ACE). Given : AD is a medium of ABC and E is any point on AD. ar (ABE) = ar (ACE). 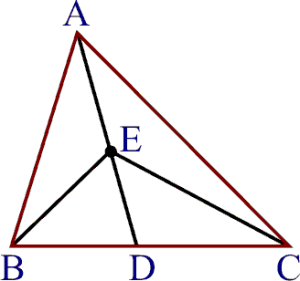 Q.2 In a triangle ABC, E is the mid- point of median AD. Show that ar (BED) = ar (ABC). Given : A ABC, E is the mid- point of the median AD. Proof : Since AD is a median of ABC and median divides a triangle into two triangles of equal area. ar (BED) = ar (ABC) . Q.3 Show that the diagonals of a parallelogram divide it into four triangles of equal area. 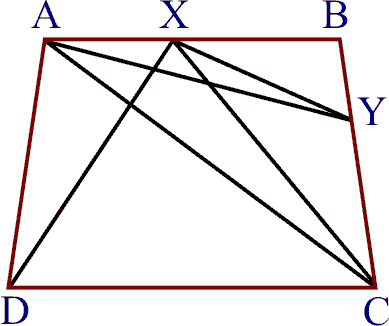 Given : A parallelogram ABCD. 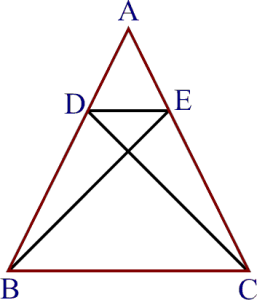 To prove : The diagonals AC and BD divide the || gm ABCD into four triangles of equal area. Construction : Draw BL AC. Proof : Since ABCD is a || gm and so its diagonals AC and BD bisect each other at O.
Q.4 In figure, ABC and ABD are two triangles on the same base AB. 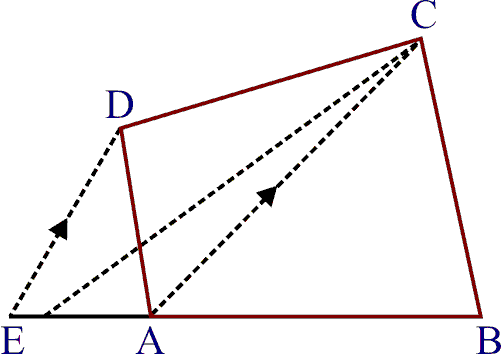 If line segment CD is bisected by AB at O, show that ar (ABC) = ar (ABD). Given : ABC and ABD are two triangles on the same base AB. A line segment CD is bisected by AB at O i.e., OC = OD. To prove : ar (ABC) = ar (ABD). Therefore AO is the median. (iii) ar (BDEF) = ar (ABC). 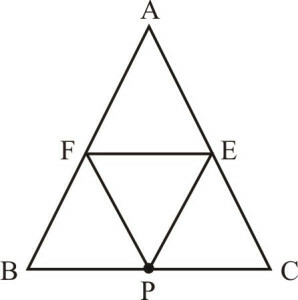 Given : D, E and F are the mid- points of the sides BC, CA and AB respectively of ABC. From (1) and (2), BDEF is a || gm. (ii) Similarly, FDCE and AFDE are || gms. ar (DEF) = ar (ABC). (i) Draw DN AC and BM AC. 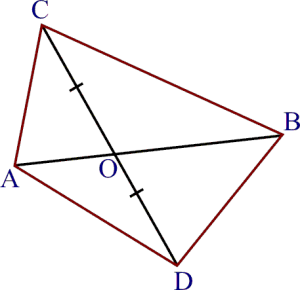 By AAS criterion of congruent. 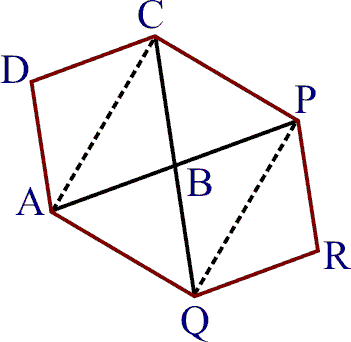 (iii) DCB and ACB have equal areas and have the same base. So, these lie between the same parallels. Q.7 D and E are points on sides AB and AC respectively of ABC such that ar(DBC) = ar(EBC). Prove that DE|| BC. Sol. 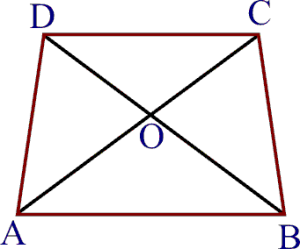 Since DBC and EBC are equal in area and have a same base BC. Therefore altitude from D of DBC = Altitude from E of EBC. DBC and EBC are between the same parallels. Q.8 XY is a line parallel to side BC of a triangle ABC. 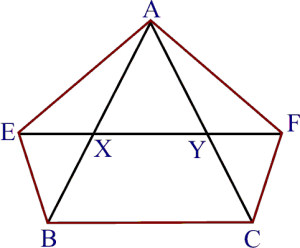 If BE|| AC and CF || AB meet XY at E and F respectively, show that ar (ABE) = ar (ACF). Therefore BCYE is a || gm. 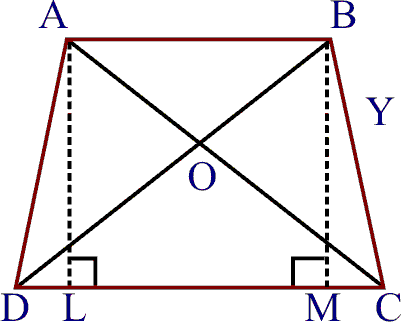 Since ABE and ||gm BCYE are on the same base BE and between the same parallel lines BE and AC. Since ACF and || gm BCFX are on the same base CF and between the same parallel AB and FC . But ||gm BCFX and || gm BCYE are on the same base BC and between the same parallels BC and EF. 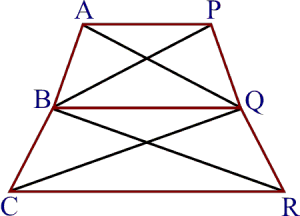 Q.9 The side AB of a parallelogram ABCD is produced to any point P. A line through A and parallel to CP meets CB produced at Q and then parallelogram PBQR is completed (see figure). Show that ar(ABCD) = ar (PBQR). 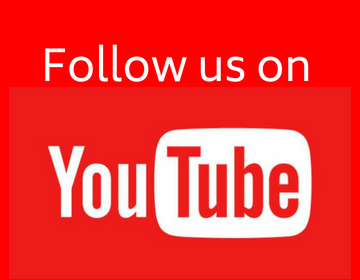 Join AC and PQ. 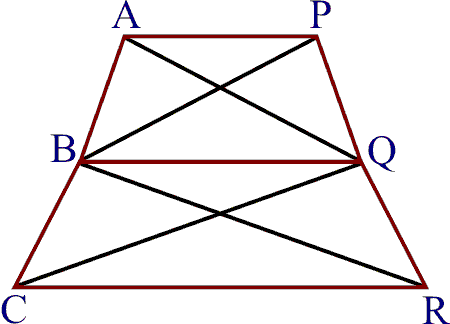 Since AC and PQ are diagonals of || gm ABCD and ||gm BPQR respectively. Now, s ACQ and AQP are on the same base AQ and between the same parallels AQ and CP. 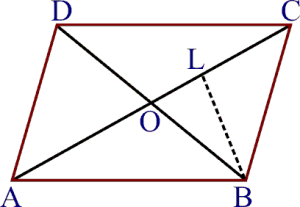 Q.10 Diagonals AC and BD of a trapezium ABCD with AB || DC intersect each other at O. Prove that ar(AOD) = ar (BOC). 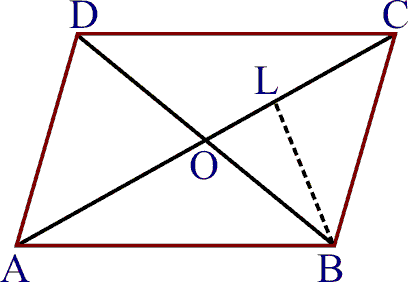 Diagonals AC and BD of a trapezium ABCD with AB|| DC intersect each other at O. Therefore s ABC and ABD are on the same base AB and between the same parallels AB and DC. 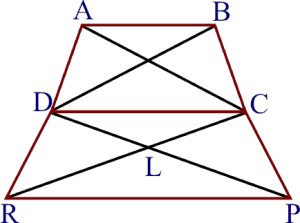 (i) Since s ACB and ACF are on the same base AC and between the same parallels AC and BF. 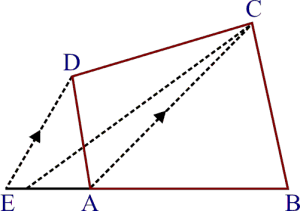 Q.12 A villager Itwaari has a plot of land of the shape of a quadrilateral. The Gram Panchayat of the village decided to take over some portion of his plot from one of the corners to construct a Health Centre. Itwaari agrees to above proposal with the condition that he should be given equal amount of land in lieu of his land adjoining his plot so as to form a triangular plot. Explain how this proposal will be implemented. 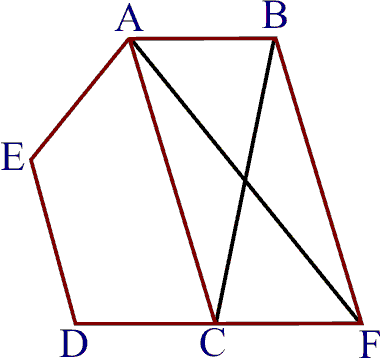 Let ABCD be the quadrilateral plot. Produce BA to meet CD drawn parallel to CA at E. Join EC. Which is the required explain to the suggested proposal. 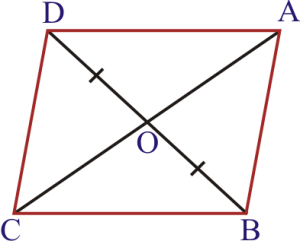 Q.13 ABCD is a trapezium with AB|| DC. 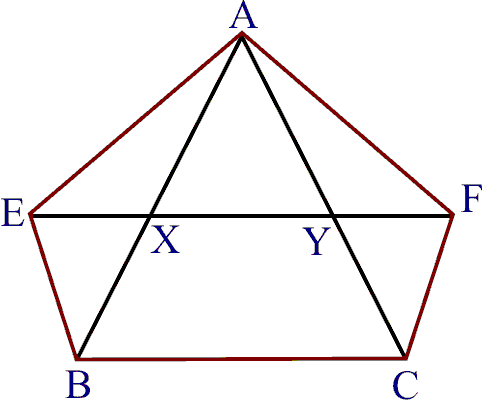 A line parallel to AC intersects AB at X and BC at Y. Prove that ar (ADX) = ar (ACY). Sol. 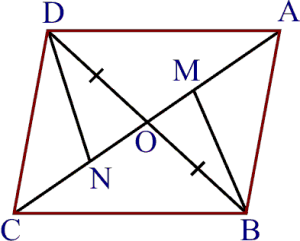 ABCD is a trapezium with AB || DC and XY|| AC, is drawn. Join XC. ar (AQC) = ar (PBR). Q.15 Diagonals AC and BD of a quadrilateral ABCD intersect at O in such a way that ar (AOD) = ar (BOC). 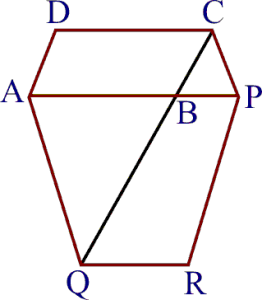 Prove that ABCD is a trapezium. Hence ABCD is a trapezium. Q.16 In figure, ar (DRC) = ar (DPC) and ar (BDP) = ar (ARC). 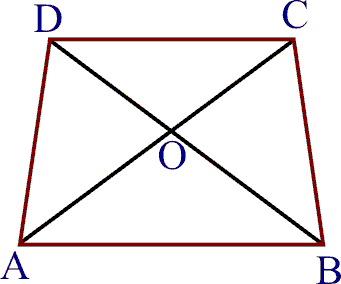 Show that both the quadrilaterals ABCD and DCPR are trapeziums. 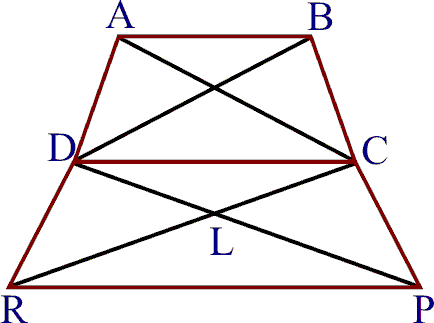 Hence , ABCD is a trapezium. 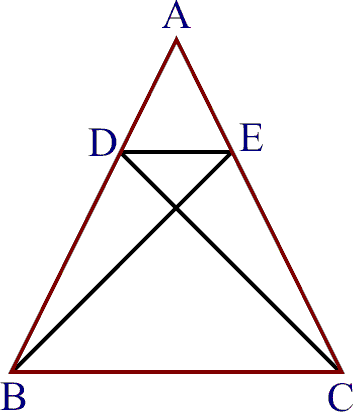 Hence, DCPR is a trapezium.